I wanted to come up with a craft that would be easy enough for my boys to do as part of our Family Home Evening. I love the little wood nativities which have been around for years. I decided to have my boys make some little nativity ornaments out of some good old card stock and cereal boxes. You could use the printable three different ways. The first way is to use the color printable and make the craft shown in the picture above. The other two options involve using the black and white printable. 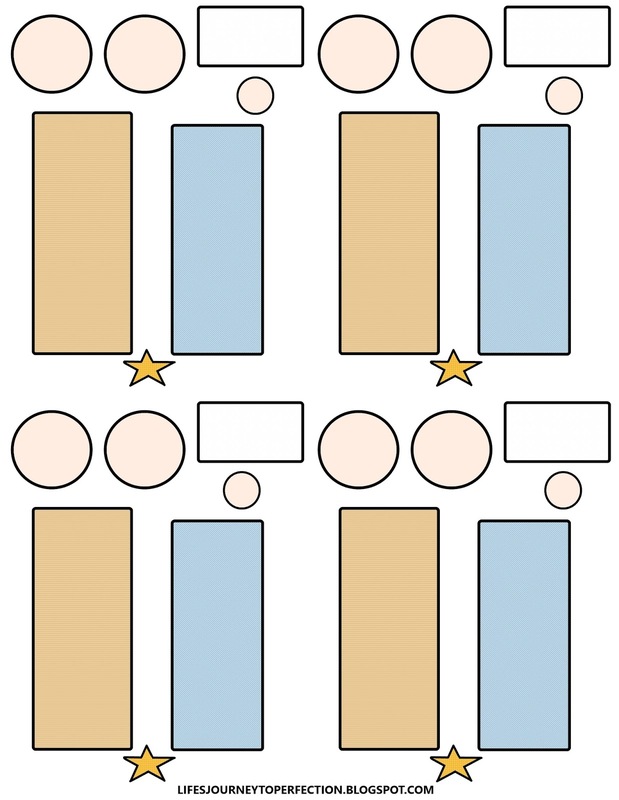 The first option is to print it on card stock and let the kids color it themselves. The second option is to use the card stock as a template and trace it out onto the cereal box, cut out and hand paint. First you will need to click on the printable and save it to your computer then you will be able to print it out just like any other jpeg image. Print it out onto card stock. If you are using the black and white version have your kids color the pieces. 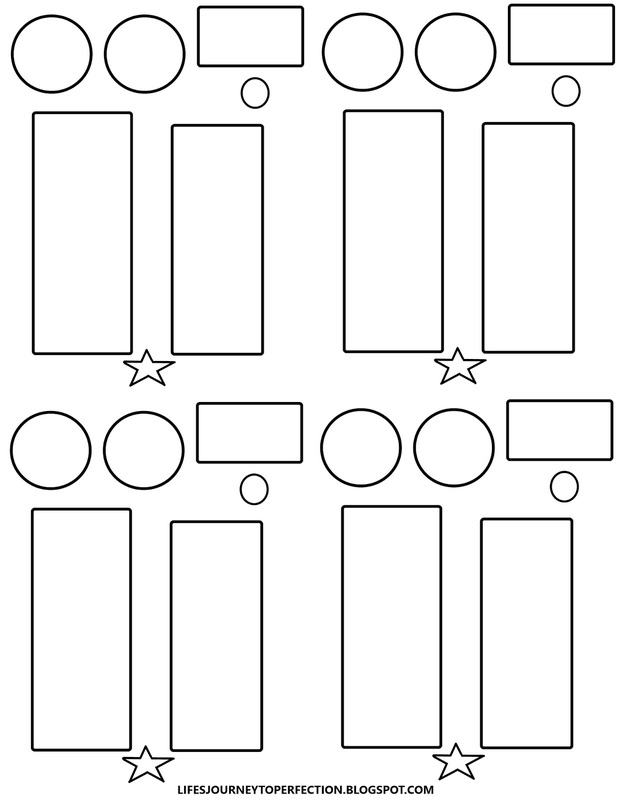 If you are using the already colored version than simply cut out the pieces. I let my kiddos cut their own pieces out, my younger two had me help them with their stars. Next, it is time to glue. Using a glue stick apply glue to the back of the card stock. 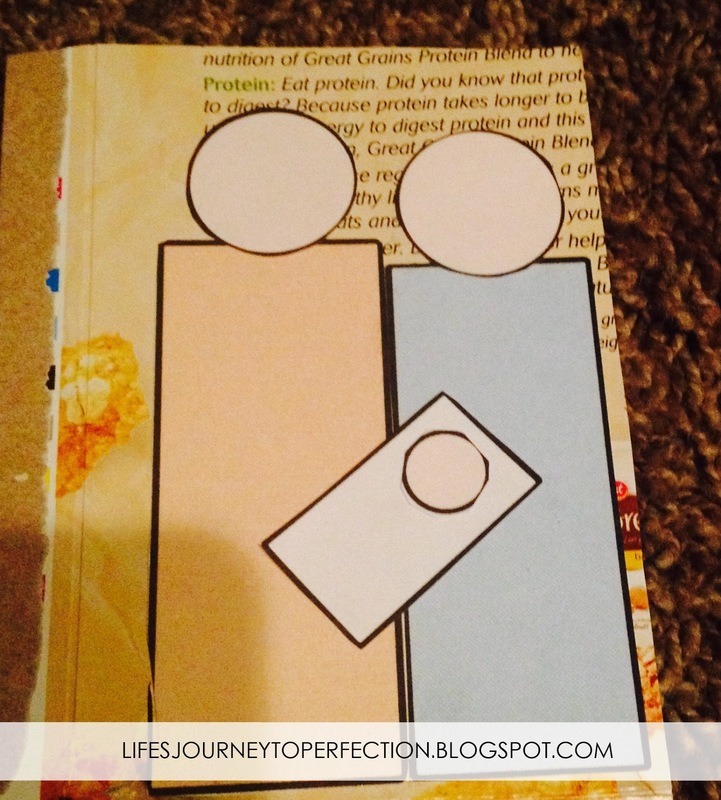 Start with the brownish piece (Joseph's body), Place it onto the cereal box (the side with writing). Next, glue on the blue piece (Mary's body). Make sure the bottoms of the two pieces line up. Then you will glue the heads onto each of the bodies. Next, glue on the white piece of baby Jesus and then the head piece. After everything is glued on similar to the picture above (can you tell my little boy cut out the pieces), then you will cut around the outer edges through the cereal box, so it is all one piece. When it is cut out, you will use an 1/8 of an inch hole punch and punch a whole where the two bodies meet towards the top. Next, you can tie the twine around and tie it into a bow. Next cut some muslin out and hot glue onto Mary's head. I used some thick string and tied it onto Joseph's head and hot glued into place. Lastly, using the pliers I made my wire into a hook shape at the top, so it could hang onto the tree and then I made it into a curly look. Inserted it into the hole and curled the end with the pliers. Then hot glued on the star. My kids wrote their name and the year on the back of their and will be adding it to their collection of ornaments on their trees. I love having my kids make things that will help them remember the Savior and the true meaning of Christmas! 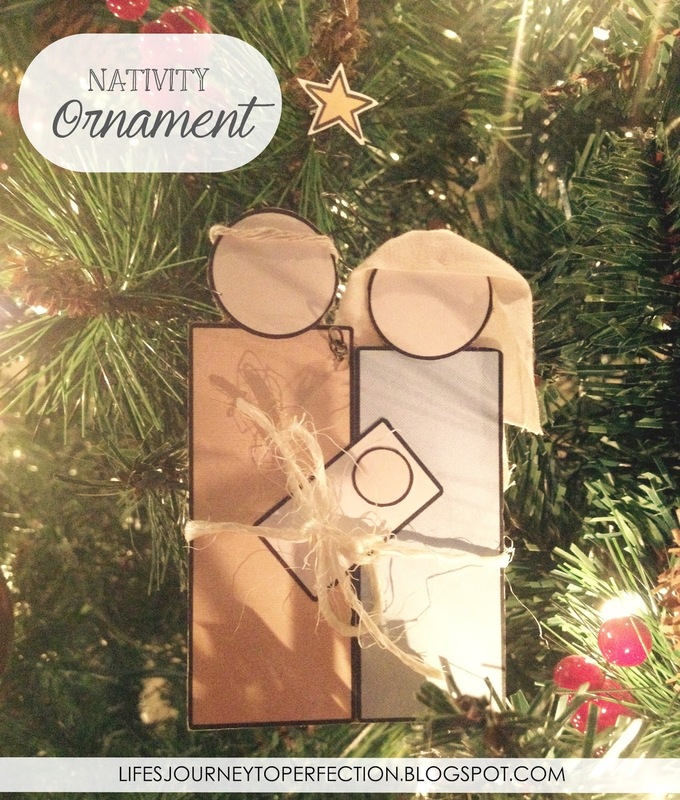 What a BEATIFUL printable ornament! I'm sharing on my FB page and pinning...oh and printing out for the kids' Christmas tree. Thanks for sharing! Thanks Kari :) I was excited to read you comment! My kids were so excited to put theirs on their trees. It was the first ornament they put on them.